The resident will experience a unique opportunity to develop proficiency in developmental vision, binocular vision, and rehabilitative vision therapy. Merging principles in cognitive visual neuroscience with human factors in private practice, the post-graduate clinician will acquire the skills needed to excel in education, research, and patient care. Objective: The resident will develop proficiency in the delivery of eye and vision care, principally directed toward vision therapy and vision rehabilitation. Outcome: The resident will provide eye and vision care services involving a minimum of 1000 patient encounters, demonstrating proficiency in reviewing intake information, obtaining a case history, and performing a comprehensive eye health and visual evaluation. These encounters will include but not be limited to: visual efficiency, visual processing, visual integration, strabismus, developmental disorders of spatial vision, attention deficit, autistic spectrum and acquired brain injury disorders. Measure: The resident will report the number of patient encounters of this type using an activity log. Goal 2: Develop the resident's expertise in the differential diagnosis and management of functional visual system disturbances. Objective 1: The resident will anticipate the appropriate diagnostic procedures based on the patient's total case history. Outcome: The resident will consistently select and successfully perform high yield procedures for each patient, including differentiating disease conditions masquerading as binocular disorders and the inverse. Measure: The resident will be evaluated quarterly by the supervisor to determine progress in test selection and application. Objective 2: The resident will rank order diagnoses optimally suited to each patient. Outcome: The resident will consistently select the most appropriate diagnosis or diagnoses for each patient, with increasing independence as the residency program progresses. Measure: The resident will be evaluated quarterly by the supervisor to assess the resident's diagnostic acumen. Outcome: The resident will consistently devise an appropriate management plan for each patient in order to best address the patient's needs. Measure: The resident will be evaluated quarterly by the supervisor to assess the resident's management skills. Goal 3: Advance the resident's skills in technology-based tests utilized for special procedures. Outcome: The resident will conduct and evaluate the results of these procedures for at least 100 patient encounters. Measure: The resident will report on the number of patient encounters of this type using an activity log. Objective 2: The resident will develop expertise in the utilization of advanced ophthalmic diagnostic instrumentation to investigate disease and establish the functional nature of strabismus and amblyopia. Outcome: The resident will perform and/or interpret tests with advanced ophthalmic diagnostic instruments including threshold visual fields, retinal photography for at least 50 patients. Goal 4: Expand the resident's skills in vision therapy procedures. Objective 1: The resident will develop proficiency in administering vision therapy procedures according to textbook guidelines, as well as adapt, customize and innovate as required for optimal patient care. Outcome: The resident will administer at least three procedures on each vision therapy patient encounter, for a minimum of 100 patient encounters, reflecting a balance between computerized and non-computerized procedures. Goal 5: Develop the resident's skills in presenting topics to fellow professionals. Objective: The resident will acquire skills needed to present information publically in a group setting. Outcome: The resident will present lectures during meetings to include weekly on-site case conferences and at least one presentation to a group off-site. .
Measure: The resident will report monthly on these types of activities using an activity log. Goal 6: The Resident will engage in scholarly activities reflective of post-graduate study. Objective: The resident will assist in the preparation of a professional manuscript based on patient care encounters on site. Outcome: The resident will prepare a manuscript (paper) of publishable quality. This may be submitted for publication. They will also have the opportunity to present a poster at the annual meeting of COVD, AOA, Academy, or NORA. Measure: The resident will complete the manuscript by the designated completion date of the Residency program. Learning Activity: The resident will provide eye and vision care services involving a minimum of 1000 patient encounters, demonstrating advanced skills in reviewing intake information, obtaining a case history, and performing a comprehensive eye health and visual evaluation. Outcome: The resident will develop advanced skills in the management of patients as mentioned above. Objective: The resident's expertise in the diagnosis and management of refractive, physiologic and pathologic conditions of the eye, theadnexa, visual pathways and central nervous system will be enhanced. Learning Activity: The resident will provide services to a significant number of patients with refractive, physiologic and pathologic conditions of the eye and vision, particularly in areas of a functional/behavioral evaluation in addition to the routine optometric examination. The resident will formulate a diagnosis based on the results of the procedures performed. These encounters will include but not be limited to: strabismus, amblyopia, binocular dysfunctions, accommodative dysfunctions, visual-auditory integration dysfunctions, visual motor dysfunctions, visual perceptual dysfunctions, visual information processing problems, ADD/ADHD, autism spectrum, acquired brain injury from stroke or from trauma. 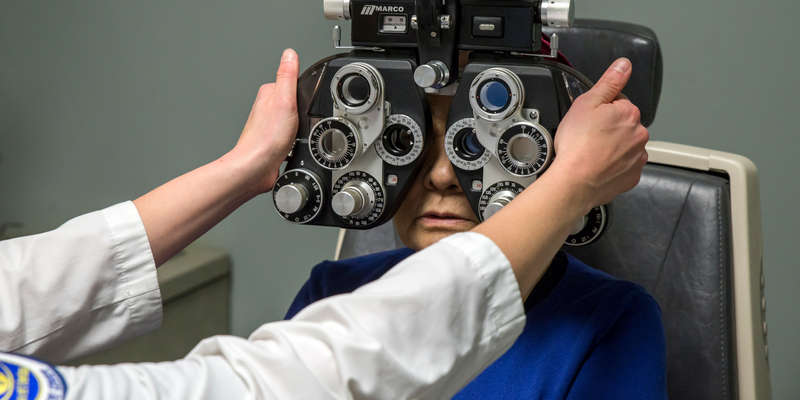 Learning Activity: The resident will perform and/or interpret ophthalmic diagnostic tests that can include electro diagnostics, ophthalmic photography, and relevant laboratory and radiological procedures. Objective: Expanding the resident's skills in vision therapy procedures. Learning Activity: The resident will develop proficiency in administering vision therapy procedures according to textbook guidelines, as well as adapt, customize and innovate as required for optimal patient care. Objective: The resident will develop and present original presentations to other professionals. Learning Activity: The resident will acquire skills needed to present information publically in a group setting, to include lectures during on-site case conferences and to a group off-site. Outcome: The resident will develop skills in providing presentations to health care professionals. A. The resident is defined as an employee of The Fortenbacher Vision Group, LLC, and the residency stipend is paid by Wow Vision Therapy, LLC. No tuition or fees are applicable. B. The resident should apply for optometric license in Michigan prior to the beginning of the residency. C. Professional liability protection for residents for professional activity performed at Wow Vision Therapy, LLC. Is provided by St. Joseph Vision Therapy Center, LLC a division of the Fortenbacher Vision Group LLC. A. The resident is required to deliver clinical services at a level that is satisfactory to the Residency Supervisor, Director of Residency Programs, and the SCO and Dr. Dan L. Fortenbacher as Optometric Director of Wow Vision Therapy, LLC. Normal operational hours are from 9:00 A.M. until 8:15 P.M., Monday through Thursday, 9:00 A.M. until 5:00 P.M. Friday, Saturday (September-May) 9:00 A.M. until 1:00 P.M with the resident working a five-day week. The resident is expected to be on site during all scheduled working hours 40-45 hours per week, except when attending or delivering lectures or doing approved visitations. The resident will occasionally be required to be on call. B. The resident is required to keep a record of patient contacts. The Supervisor of the Residency Program and the Director of Residency Programs will review the resident's activity periodically. C. The resident is required to write a publication quality paper based on original research, literature review, or a clinical case. This paper will be turned in to the supervisor and the Director of Residency Programs at SCO. It may be submitted for publication if the resident decides to do so. E. The resident is expected to perform in a professional manner in the delivery of patient care services and to observe those proprieties of conduct and courtesies that are consistent with the rules and regulations governing Wow Vision Therapy, LLC and Southern College of Optometry Residency Programs. H. Any resident accepted for training can be dismissed, without receiving a certificate of completion, for infractions of the rules and regulations of Wow Vision Therapy, LLC or those set forth by Southern College of Optometry, or for any action which jeopardizes the safety of patients, personnel, or physical facilities. A residency stipend will be provided for the year of training paid by the clinic. The stipend is currently $37,000 the 2019 Residency beginning in July 1, 2019- June 30, 2020. Compensation is not contingent upon productivity of the resident. Additional benefits such as FICA and professional liability insurance are also funded by the clinic. The resident will have the opportunity to purchase health insurance through Wow Vision Therapy, LLC. The residency program at Wow Vision Therapy, LLC is fully accredited by the ACOE, 243 N. Lindbergh Blvd., St. Louis, MO 63141, 314-991-4100.